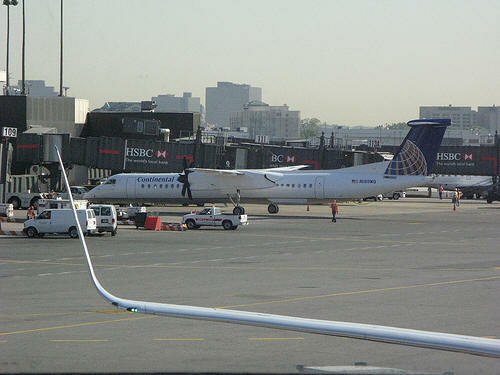 On February 12, 2009, about 10:17 p.m. Eastern Standard Time (EST), a Colgan Air Inc., Bombardier Dash 8-Q400, N200WQ, d.b.a. Continental Connection flight 3407, crashed during an instrument approach to runway 23 at the Buffalo-Niagara International Airport (BUF), Buffalo, New York. The crash site was approximately 5 nautical miles northeast of the airport in Clarence Center, New York, and mostly confined to one residential house. The 4 crew members and 45 passengers were fatally injured and the airplane was destroyed by impact forces and post crash fire. There was one ground fatality. Night visual meteorological conditions prevailed at the time of the accident. The flight was a Code of Federal Regulations (CFR) Part 121 scheduled passenger flight from Liberty International Airport (EWR), Newark, New Jersey to Buffalo. “The tragedy of flight 3407 is the deadliest transportation accident in the United States in more than 7 years,” Acting Chairman Mark V. Rosenker, who will chair the hearing, said. The NTSB has voted to conduct a public hearing on this accident. The hearing, which will be held May 12 – 14, 2009 at the NTSB's Board Room and Conference Center in Washington, D.C., will cover a wide range of safety issues including: icing effect on the airplane’s performance, cold weather operations, sterile cockpit rules, crew experience, fatigue management, and stall recovery training. The public hearing is part of the Safety Board’s efforts to develop all appropriate facts for the investigation. The aircraft wreckage has been moved from the accident site to a secure location for follow-on inspections as may be needed. A preliminary examination of the airplane systems has revealed no indication of pre-impact system failures or anomalies. Investigators will perform additional examinations on the dual distribution valves installed in the airplane’s de-ice system. The de-ice system removes ice accumulation from the leading edges of the wings, horizontal tail, and vertical tail through the use of pneumatic boots. The dual distribution valves, which transfer air between the main bleed air distribution ducts and the pneumatic boots, were removed from the airplane for the examination. The airplane maintenance records have been reviewed and no significant findings have been identified at this time. The ATC group has completed a review of recordings of controller communications with the flight crew during the accident flight and conducted interviews with air traffic controllers on duty at the time of the accident. The group has no further work planned at this time. Further review of the weather conditions on the night of the accident revealed the presence of variable periods of snow and light to moderate icing during the accident airplane’s approach to the Buffalo airport. Examination of the FDR data and preliminary evaluation of airplane performance models shows that some ice accumulation was likely present on the airplane prior to the initial upset event, but that the airplane continued to respond as expected to flight control inputs throughout the accident flight. The FDR data also shows that the stall warning and protection system, which includes the stick shaker and stick pusher, activated at an airspeed and angle-of-attack (AOA) consistent with that expected for normal operations when the de-ice protection system is active. The airplane’s stick shaker will normally activate several knots above the actual airplane stall speed in order to provide the flight crew with a sufficient safety margin and time to initiate stall recovery procedures. As a result of ice accumulation on the airframe, an airplane’s stall airspeed increases. To account for this potential increase in stall speed in icing conditions, the Dash 8-Q400’s stall warning system activates at a higher airspeed than normal when the de-ice system is active in-flight to provide the flight crew with adequate stall warning if ice accumulation is present. Preliminary airplane performance modeling and simulation efforts indicate that icing had a minimal impact on the stall speed of the airplane. The FDR data indicates that the stick shaker activated at 130 knots, which is consistent with the de-ice system being engaged. FDR data further indicate that when the stick shaker activated, there was a 25-pound pull force on the control column, followed by an up elevator deflection and increase in pitch, angle of attack, and Gs. The data indicate a likely separation of the airflow over the wing and ensuing roll two seconds after the stick shaker activated while the aircraft was slowing through 125 knots and while at a flight load of 1.42 Gs. The predicted stall speed at a load factor of 1 G would be about 105 knots. Airplane performance work is continuing. Since returning from on-scene, the Operations & Human performance group have conducted additional interviews with flight crew members who had recently flown with and/or provided instruction to the accident crew, as well as personnel at Colgan Air responsible for providing training of flight crews and overseeing the management and safety operations at the airline. The group also conducted interviews with FAA personnel responsible for oversight of the Colgan certificate, which included the Principal Operations Inspector (POI) and aircrew program manager for the Dash 8 Q-400. The team has also continued its review of documentation, manuals, and other guidance pertaining to the operation of the Dash 8 Q-400 and training materials provided to the Colgan Air flight crews. The Operations & Human Performance group continues to investigate and review documentation associated with the flight crew’s flight training history and professional development during their employment at Colgan as well as prior to joining the company. Post-accident toxicological testing of the flight crew was performed by the FAA Civil Aerospace Medical Institute (CAMI) toxicology lab. Specimens taken from the first officer were negative for alcohol, illicit substances, and a wide range of prescription and over the counter medications. Specimens taken from the captain were negative for alcohol and illicit substances, and positive for diltiazem, a prescription blood pressure medication that had been reported to and approved for his use by the Federal Aviation Administration. The Safety Board is also examining several other areas potentially related to the accident, including:The circumstances of a recent event involving a Dash 8-Q400, operated by Colgan Air, in which the airplane’s stick pusher activated during approach to the Burlington International Airport (BTV) in Burlington, Vermont. A preliminary review of the FDR data from that flight shows the momentary onset of the stick shaker during the approach phase of flight. The airplane subsequently landed without incident. NTSB investigators have conducted interviews with the pilots and check airman on board this flight and will continue to investigate the incident. Reports of airplane deviations resulting from distortion of the instrument landing system (ILS) signal for runway 23 at BUF. There is an existing Notice to Airmen (NOTAM) related to this distortion condition. 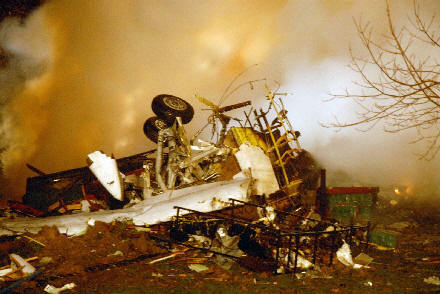 To date, investigation into these reports has not revealed any connection to the accident flight.